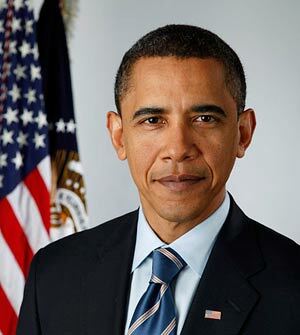 Barack Obama served as the 44th President of the US from 2009 to 2017. Obama passed several bills, which sought to extend welfare support and help the economy to recover from the Financial and Economic Crisis of 2009. His primary legislation included health care reform (Protection and Affordable Care Act), and The American Recovery and Reinvestment Act of 2009. Obama also approved a major bailout of the automobile industry. In Foreign Policy, Obama sought to end the war in Iraq, though he committed military support to combat the growing presence of IS in Iraq and Syria. Obama also signed up to the 2015 Paris Climate Change Agreement. Despite a fractious political system, Obama was noted for retaining a dignified and calm demeanour, seeking to unite the country in the face of divisive issues. He is widely regarded as a charismatic speaker – frequently speaking on the ideals of hope and optimism. Barack Obama was born 4 Aug 1961 in Hawaii. His father was a Kenyan intellectual and his mother a white teenager from Kansas. When Barack was still young, his father abandoned the family and Barack would only meet his father on a few future occasions. After a brief spell living in Indonesia, he moved back to Hawaii where he was raised by his grandparents. For some years, Obama’s nationality was the subject of intense speculation by the right-wing media, and figures such as Donald Trump – suggesting Obama was not American. Obama later produced two birth certificates to prove his nationality. After studying law at Harvard, he worked as a civil rights lawyer in Chicago. It was here in Chicago that he met his future wife, Michelle. They married in 1992 and had two children. In 1996, he gained his major political breakthrough serving in the Illinois State Senate. In 2004, he was elected to the US Senate where he gained a reputation as one of rising stars in the Democrat Party. 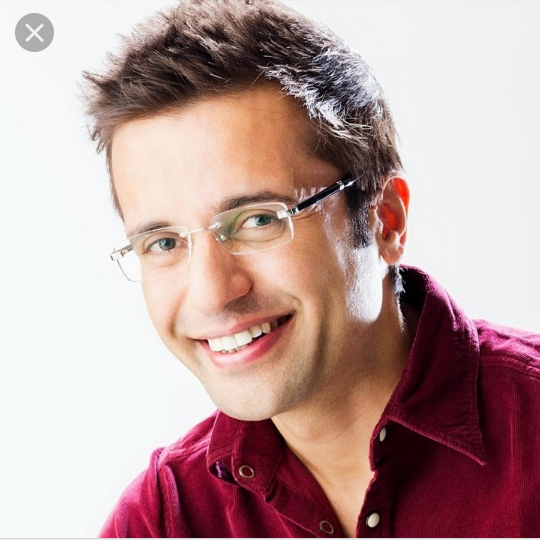 His book ‘The Audacity of Hope’ became a best seller and increased his national profile. In the aftermath of the Iraq war, his reputation was enhanced by his previous opposition to the war. 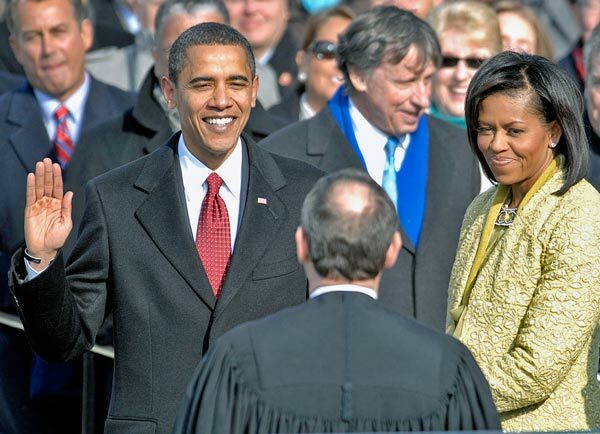 US President Barack Obama taking the Oath of Office in 2009. Despite a lack of political experience, he put forward his name for the Democratic presidential candidate in 2008. Against the stiff opposition of Hilary Clinton, Obama ran a near perfect campaign. His campaign generated a flood of popular grassroots support, making use of social media and internet networking. Against the much older Republican candidate Senator John McCain, Obama won a hard-fought contest taking the 2008 presidential election. His victory was greeted with an unusual degree of enthusiasm and excitement – not just in America, but around the world. After decades of racism and segregation blighting American society, the election of the first black American president was hugely symbolic. On becoming President, he found the political environment hostile. The Republican-dominated Congress was able to block much of Obama’s key legislation. However, with considerable modifications, he was able to pass a health care bill which went a considerable way to ensuring greater universal provision. Obama was elected on a liberal platform. Before the election, he promised to close down Guantanamo Bay and improve America’s image abroad. Compared to other American political figures, he is perceived as less accommodating to Israel and more sympathetic to the Palestinian position. In 2011, the US was the only country to veto a Security Council resolution condemning illegal Israeli settlements. However, one of his last acts as President in Dec 2016 was for the US to abstain on a similar motion condemning Israeli settlement building. A year into his presidency, he was awarded the Nobel Peace Prize (2009) for his promise to promote world peace. Many thought this somewhat premature for occurring at the start of his presidency. In 2010, he signed with Russia the New START (Strategic Arms Reduction Treaty) which included a reduction in nuclear arms between the two countries; though in 2015, relations between the two countries soured after the Russian invasion of the Ukraine caused Obama to initiate economic sanctions against Russia. In 2011, he ordered the assassination of Osama Bin Laden – the person blamed for 9/11 and a target who had evaded the administration of George W Bush. 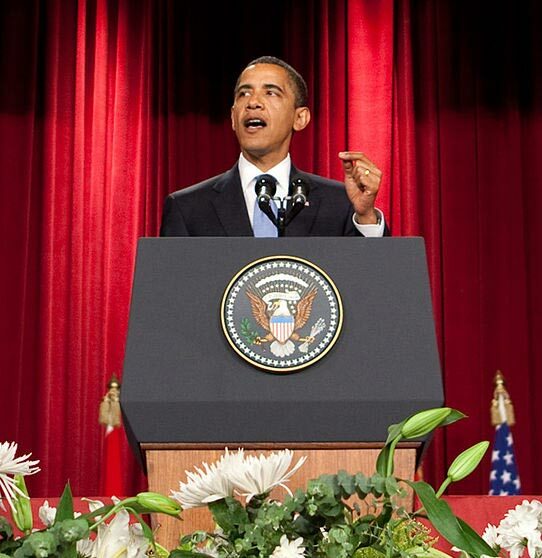 Obama pledged to end American troops involvement in Iraq and by 2011 could announce all troops would be leaving Iraq. Troops have remained in Afghanistan. In an era of increased partisanship, Obama has sought to rise above the political fray and present a vision of a united America, a country which transcends the division of race and politics. 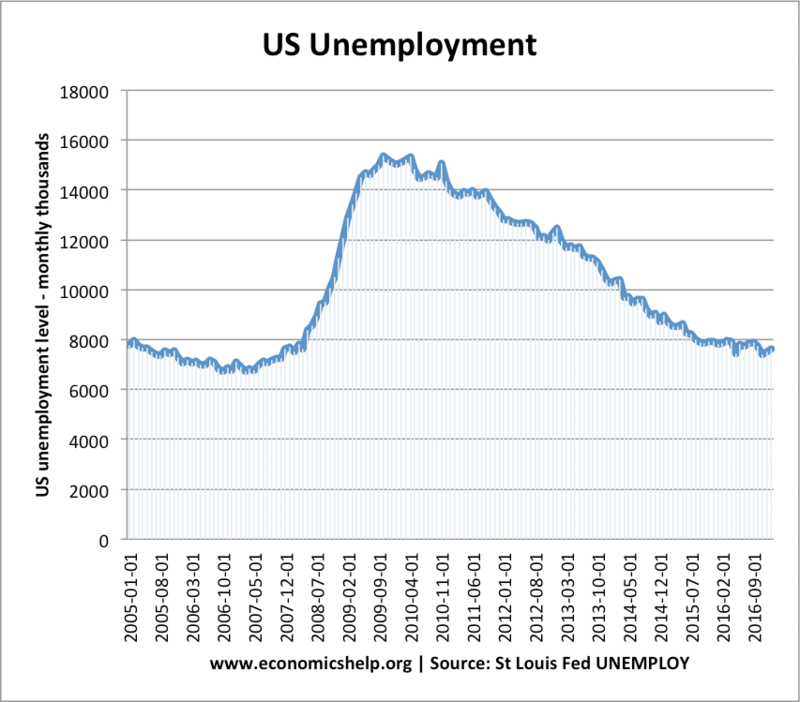 Assuming office in Jan 2009, Obama inherited an economy struggling to overcome the deepest recession since the 1930s. In 2009, he passed an economic stimulus package, which included $831 billion of economic stimulus – including tax cuts, unemployment benefits and infrastructure spending. Despite criticisms, the package increased the budget deficit; it helped to boost economic recovery and unemployment fell significantly during Obama’s presidency. The US recovery proved quicker than comparable economies in Europe, but growth was uneven – with low wage growth. In 2010, Obama also passed the Dodd–Frank Wall Street Reform and Consumer Protection Act, which sought to reform the banking and financial sector, in the aftermath of the credit crunch. Despite concerns about the economy, in 2012, Obama was able to win re-election, defeating the Republican candidate Mitt Romney. In domestic policy, his biggest policy initiative was in health care ‘Affordable Health Care Act – often termed ‘Obama Care’ It was passed into law in 2010, and upheld by the Supreme Court in late 2012. Enrollment in the program began in October 2013. Despite some initial technical difficulties, it has led to an increase in the percentage of Americans with health insurance. A CDC report showed the proportion of people without health insurance fell from 16% in 2010 to 9% during the Jan–June 2016 period. Obama describes himself as Christian. He was raised as Christian, though not as a regular churchgoer – saying that he made that choice in adult life. He also believes that different faiths and religions can share the same values and lead to the same goals. Barack Obama has two daughters, Malia and Sasha.